Well, it seems like a month of returns: I picked up my saxophones for the first time in a long time, just out of curiosity regarding their condition. (I’ve not played them since 2005, and, well, it shows in the condition of the horns.) I also decided to try get and run an RPG game for an evening, and see if I enjoyed it. I’d long resisted the idea of trying out a role-playing game because they’re kind of a time-sink, or they used to be back when I last was an avid player. People have come to think of the term RPG as meaning computer games. Which is unfortunate, because there is nothing of the RPG experience I value and crave in a computer game. RPGing for me is a little bit of a mix between group storytelling, amateur theater, and gameplay. Computer “RPGs” don’t usually allow for that kind of thing to anywhere near the degree I want in a game. The pencil-and-paper RPG world has transformed, with all kinds of indie-RPGs out there now. No longer is it a world dominated by big, hardcover glossy books, like when I stopped playing. Sometimes there are funny-shaped dice, sometimes the mechanics depend on other resolution systems, sometimes there are GMs and sometimes there aren’t… and, best of all, some games require really minimal preparation, or even none whatsoever. While I’m not so happy about the first point above, the second point makes me really, really happy. Since the last RPG game I ever played at any length was White Wolf’s Wraith: The Oblivion–the most horrific and dark of their World of Darkness line–I figured a return via a dark, scary, horror-based narrative would be in order. 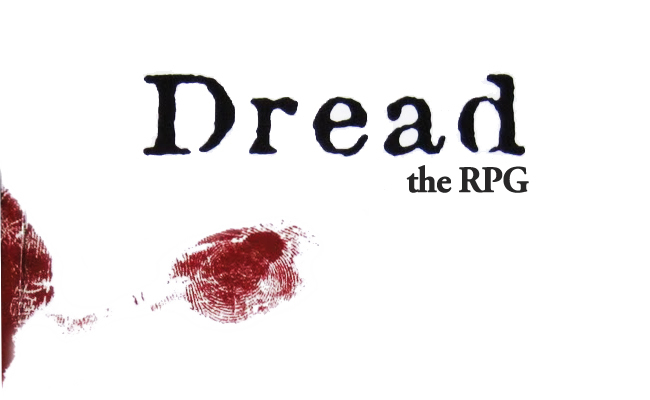 After a little looking around, I happened upon the award-winning game Dread. Dread is infamous because, in place of the die rolls so common in older game systems, it uses Jenga as its resolution device. This is weird, and unusual, and also is widely considered to be very effective, as long as your players aren’t the type to avoid risk-taking behaviour on the part of their characters. (More about that below.) Basically, for every character there are two kinds of tasks: those they can do without having to pull from the Jenga tower (either because anyone can do them, or because the character has a particular skill in the area), and those which are a challenge, and thus warrant a pull from the Jenga Tower. This quickly becomes daunting because if the Jenga tower falls, something bad happens. Normally, the character of the person who causes it to fall ends up being taken out of the game–death, paralysis, madness, zombification, being kidnapped and turned into a vampire’s love slave, achieving brain-meld with a predatory alien… whatever the in-game result, the practical effect is that if you knock the tower down, you’re out. (But if you choose to knock it down on purpose, you’re out while achieving a heroic sacrifice, and your attempted action succeeds.) Characters can choose not to pull, or can abandon pulls, as long as they’re cool with failing on the action they attempt. That’s half of the innovation in Dread. The other half is the character generation method, which I’d characterize as being basically pop-psychology manipulation. The person who “hosts” (ie. runs) the Dread game sets up the roster of potential characters, and then writes up a questionnaire for each of the characters. There’s an art to this, because the questionnaire sets up characters that have some history, some problems, some hopes and dreams, and some serious flaws. The players get the sheets, fill them out as much as possible on their own, and then introduce their characters, continuing to fill out information and thicken the material of the story. The person running the game is responsible for finding sufficient threads, plot hooks, and themes in the various character sheets to construct an improvised story, which, well, it’s tough… especially when you’re in a dark room and can’t consult at the character sheets easily. Dread sounds fantastic! I’ve played a couple games over the last few years, but like you not such since the heyday of the 90’s. Something like this, though, could definitely bring me back. You might be very interested to check out my observations in part 3 of this series, coming Wednesday. I spent some time thinking about what I learned about the game, about horror-narrative structure, and about setting up scenarios for a Dread game, and boiled it all down to a details (if slightly disorganized) post. Cool! Looking forward to seeing the detailed blow-by-blow. I’ve played a couple of cool indie games–Risus, Lady Blackbird, and a couple of others. It’s more a lack of people rather than a lack of products that keeps me from playing these days. The detailed blow-by-blow is online now: if you have a look at the menu at the end of the post, it’s #2. #3, which may be up by the time you see this, focuses on what I learned during our session, and #4, which is scheduled for Thursday evening, is basically just my “Talent Night” scenario released under a Creative Commons license. It was a great game, and I think it has a lot of potential not just for straight horror, but also comedic-horror crossover (Buffyverse stuff, even?) and other horror-related subgenres. I imagine if one had enough players, it’d make a killer mechanic for a weekend-long zombie RPG marathon, as long as you adjusted the tower-collapse rule somehow, maybe with a card-pull variant where if it collapses once in a night, you pull from Deck A (Consequences), if it’s the second collapse, the Deck B (Serious Consequences) and if it’s the third pull in a specific session, then resolve as usual. That’d allow the characters some longevity, while still introducing a potential cost for pulls gone wrong. You should give GRIN a try (http://www.drivethrurpg.com/product/154984/Grin) its a free, one page horror RPG with a very Dread feel (minus the Jenga Tower).